In this blog post we'll clear up some of the most common questions Stannah has heard about goods lifts. If you have a question that isn't covered here then please do get in touch and we'll be happy to help! What is a goods lift? These lifts are meant to carry goods. They are traditionally seen in back of house applications, such as catering environments, moving stock in warehouses and retail storage areas. Due to their application they are built to be rugged and sturdy and can travel up to 15 metres or five stops. There are several types of lift, from low-rise small lifts for roll-cages to larger versions travelling over several floors to move hospital beds. There are also goods attendent lifts that enable up to two people to accompany the load. How do I know what type to choose? Depending on what you are wanting to lift, the site constraints and the frequency of use, will determine the what type of lift you need. Take a look at our 7 questions to help choose the right goods or service lift for you to help you decide . Have I got room in my building? Your lift provider will survey your premises to advise about how your premises will accommodate a lift and how you can position it to help you the most. I'm concerned I have limited space. How do the doors open? Most come with a choice of door configurations, hinged doors to give the largest opening, or concertina doors that fold back to save space in front of the lift. I have reduced space at the upper floor of my building. Does this matter? There are reduced headroom options for most situations and reduced pit models too. I'm not sure I can build a pit. Is there an alternative? In circumstances where a pit is not possible a ramp can be fitted. You will need to factor in the extra space required on the lowest floor to accomodate the ramp (image below gives an example). I have a low flight flight of stairs and/or ramp in my premises that makes moving pallets of goods physically demanding. What are my lift options? 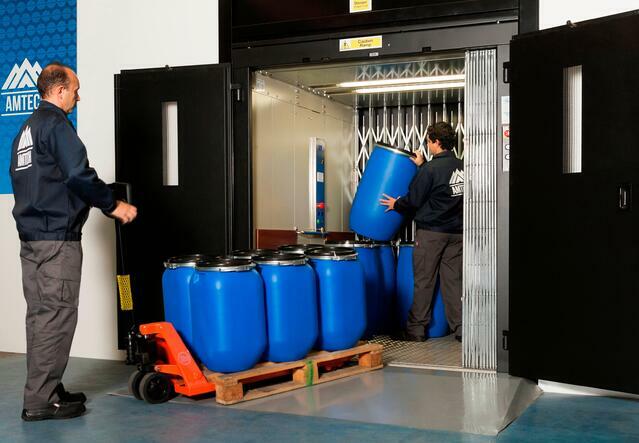 Step goods lifts can be installed to overcome a change in levels of up to 1.5 metres. This is an investment that saves time, money and potential injury to staff as well as improving customer service. I need access to a mezzanine level. Can this provided via a lift? You can certainly use a lift to access a mezzanine. You can install a goods-only or goods attendent lifts depending on the nature of your goods and the function of the mezzanine level. Most lifts are structure-supported so minimal fixings to the building are required. Do I need to build a lift shaft? It depends on the product you choose. Our larger goods lifts can be supplied structure-supported so there would only be a need to build an enclosure that is not load bearing. The enclosure guards the machinery – the working parts of the lift. Can I travel in the lift? If you need to travel with your goods you will require an attendent controlled version with controls inside the lift. Since the change in the Machinery Directive in 2010 it is possible to carry up to two operatives with the goods. Do goods lifts have similar operating controls to passenger lifts? The operating switches for goods-only lifts are on the landing entrances of the lift. You can send or call the lift from each landing. If you need to travel with goods then there will be additional constant-pressure operating buttons inside the lift as well as additional safety features. If I decide I need one how long will I have to wait to install it? Your new lift will have a lead time for the manufacture of your bespoke requirements. Once delivered, work in installing the lift can be done in just a few days. You may need builders work before installation depending on where your lift is positioned. What level of disruption to my business can I expect when the lift is installed? Just a few days is usual and do bear in mind that the lift will benefit your business in the long term. Here at Stannah we do our very best to minimise any interruption to business. 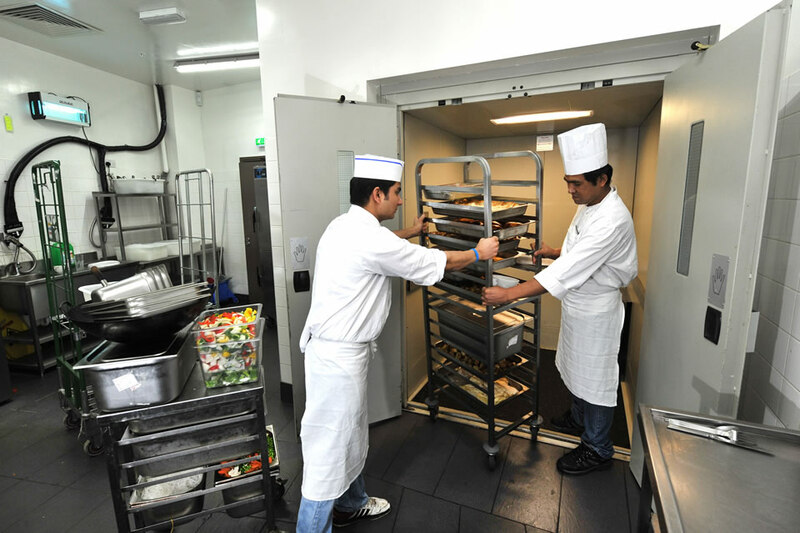 If you have more questions about dumb waiters or goods lifts then please take a look at our free eBook, Goods lifts: your questions answered. We hope we have helped you with making your choice about a goods lift. If you'd like to arrange a FREE site visit then please get in touch - we know we can help!